This encouragement essay first appeared on The End Time in February 2010. Christians who diligently focus on worship, study, encouragement, and ministry are doing the right thing. But Paul eagerly looked forward to his crowns and to the rewards awaiting him. He often encouraged his brethren with news of the future rewards and glory. "I have fought the good fight, I have finished the race, I have kept the faith. Finally, there is laid up for me the Crown of Righteousness, which the Lord, the righteous Judge, will give to me on that Day, and not to me only but also to all who have loved His appearing." (2 Timothy 4:7-8). We are made a promise, "Be ye strong therefore, and let not your hands be weak: for your work shall be rewarded." (2 Chronicles 15:7) It is right and also good to look forward to what the Lord has prepared for us, including rewards, for they are also His handiwork. In 2000, miners accidentally broke through to a heretofore unknown chamber. 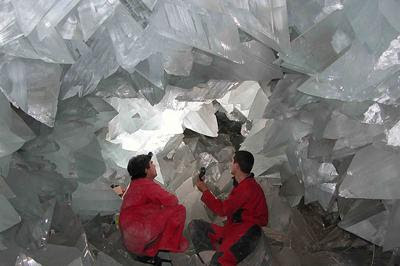 It contained the most magnificent crystals ever seen anywhere on earth, absolutely stunning the geologists. 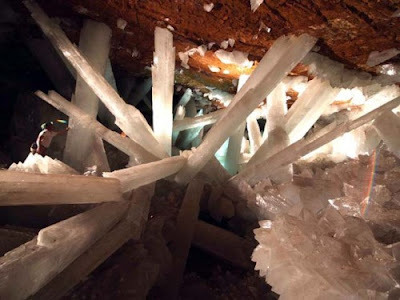 Some of the crystals had grown to be 60 feet high. 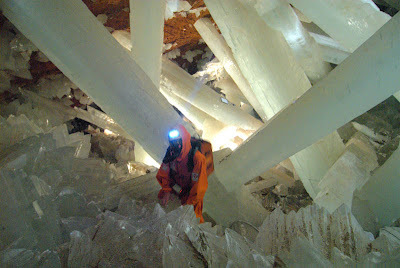 The place is called the Cave of Crystals and it is in Naica, Mexico. Because the chamber is exceedingly hot and humid and humans are overcome with the bad air within minutes, and also to preserve the display, the cave is closed to visitors except under strict circumstances. "This year, BBC Two sent Professor Iain Stewart into the cave, and he "got a rare glimpse of the subterranean spectacle while filming for the new BBC series "How the Earth Made Us." If you ignore the show title and focus on the cave, you will be blessed. The trailer is only 1:20 minutes. Now, Christian, capture the wonder and amazement of the beauty of these magnificent and translucent crystals and translate that to a tiny window of the beauty of the gems and crystals that are awaiting us in New Jerusalem! Oh, the tremendous beauty that is awaiting us with our Lord! His creativity is unparalleled. That He will share this beauty with us is amazing in itself, but that He is creating it for us, to dwell with him, is enough to bring me to my knees. When you watch this video of the gorgeous crystals, think of the street of gold in New Jerusalem, think of His light and His glory illuminating the entire city, the world, the universe. Think on this: "And if I go and prepare a place for you, I will come again, and receive you unto myself; that where I am, there ye may be also." (John 14:3). The place He is preparing is so much more beautiful than the Crystal Cave at Naica, the mind cannot conceive its artistry. Will YOU be there? You will be if you ask Him forgiveness of your sins and make Him the Lord and Savior of your life. Understand that sin cannot enter into the heavenly realms and that you, if you have sin in you, will be excluded from this glory. But if you repent of it and ask Him to forgive, you will be walking the street of gold with all the other forgiven sinners in eternity. 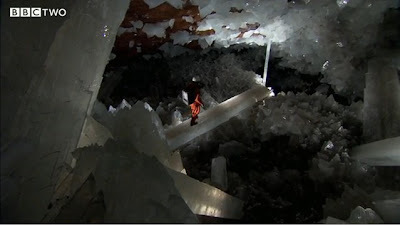 Christian, the Crystal Cave at Naica is not what awaits. What He is preparing for us is even better. Can our eyes take it in? Can our hearts remain beating or explode with joy at His grace and generosity? When you feel tired, when satan whispers 'it's not worth it' or 'why bother', think on New Jerusalem's beauty that the Lord took care to make for us, and persevere.